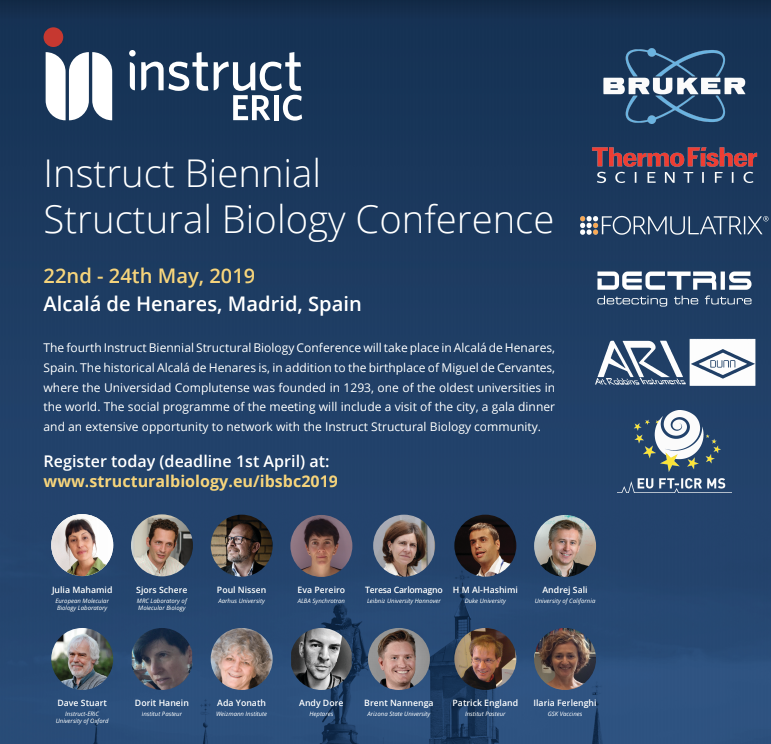 The 4th Instruct Biennial Structural Biology Conference will take place in Alcalá de Henares, Spain, from May 23 till May 25, 2019 and registration is now well under way. The historical Alcalá de Henares is, in addition to the birthplace of Miguel de Cervantes, where the Universidad Complutense, one of the oldest universities in the world, was founded in 1293. The Instruct Biennial Conferences now in its 4th edition has a strong focus on integrative structural biology and its impact on biological research and biomedicine. The programme this year includes sessions representing recent structural biology highlights, emerging methods and technologies and results of biomedical importance. In addition, past awardee Lucia Banci will introduce the new Ivano Bertini Award recipient sponsored by Bruker. There will be an opportunity to visit the booths of our industrial sponsors: Bruker, Thermofisher, Formulatrix, Dectris, Dunn and also our academic sponsors and collaborators EU FT-ICT MS, Instruct-ULTRA, RI_VIS and Corbel. The conference will close with the award of prizes to the best posters and fellowship certificates to the 10 students selected from their abstracts.